I created a short story to stimulate their imaginations. “Indulge in this delicious fantasy! Imagine you are the ultimate genius and athlete. 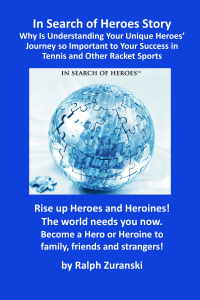 You are a tennis super star, earning gazillions of dollars annually. International fame is yours. “You are admired and respected internationally for shattering the previously accepted mental and physical barriers of human performance. How does it feel to possess superior coordination, unlimited endurance, incredible strength, and an integrated body and brain? “What is it like to be ambidextrous mentally and physically, using both the right and left sides of your body and brain hemispheres? How would you describe the reality of using 90% of your brain rather than the norm of 10%? The above story is a fantasy, but potentially real. Back in 1980, when I first created the “Tennis Challenge of Balance” program, Lionel Burt, the inventor of the Dual-Grip tennis racket gave me one to test. I learned of the incredible human physical and mental powers possible when both sides of the body and brain are developed equally. The dual-grip on the tennis racket made it easy to play two-handed off both sides and use forehands for shots out wide. I practiced with the Dual-Grip tennis racket every day. I did my mental aerobic drills often because it was so much fun. The results were so incredible. The rest is history! The Dual-Grip tennis racket is a revolution in technology and will have a great impact on most racket sports. A significant percentage of the top money winners in tennis use two-hands. As Pancho Segura says, “with so much money coming into the game now, eventually some super athlete will come along who is versatile enough to play with either hand or both hands, both sides…if only I could have had my two-handed forehand both sides.” (London Financial Times, In My View by John Barrett, March 31, 1993). If you incorporate the learning techniques that are a result of brain research with balanced exercise anything is possible.